Shiar Nayo is a Syrian journalist, activist and anarchist of Kurdish descent who has lived in exile for around a decade. In this interview, Shiar talks to us about the relationship between Syrian-Kurdish forces and other Syrian opposition groups, both before and after the revolution; about the thorny relationship between Kurdish activists and the Democratic Union Party (PYD) and other pressing Kurdish questions that have become more urgent that ever. Joseph Daher: Let’s start with your involvement with the Qamishli uprising in 2004 and the Syrian revolution that began in 2011. Why did you participate in them and what was your role? Shiar Neyo: I cannot really say that I participated in either of them, to be honest, because I was outside Syria and could not go back, due to being a refugee and wanted by the (Syrian) security apparatus. My role was limited to supporting some activists inside Syria with secure communications, setting up and managing some websites and, from time to time, writing and editing news under various pseudonyms – all by virtue of my modest experience in these things. Of course I also participated in demonstrations and events abroad in support of the Qamishli uprising and the Syrian revolution, like many Syrians in exile. As to why, well, I don’t think any activist or intellectual who really believes in the revolutionary slogans they pronounce could not participate in popular movements of this kind; movements that Syrians have been dreaming of for decades. I know many leftist activists and intellectuals who distanced themselves from both movements under the pretexts of violence, militarisation, the growing influence of reactionary forces, and other flimsy excuses. One can only say to these people and their likes that the world is more complicated than your idealistic notions of socio-political change, and if you don’t get involved in major events like these and leave the arena to others, you only have yourselves to blame if the ultimate outcome is not to your liking. Can you tell us more about the Kurdish uprising of 2004? This is one of of very few occasions that I have agreed to talk about the Qamishli uprising and the Syrian revolution. Because, frankly, I’m rather embarrassed to talk about events that I wasn’t actually involved in. There are many others who are far more worthy and qualified than me to speak about them. So everything I’m going to say reflects my own personal perspective in my capacity as almost an outside observer – even though my family and social connections inside Syria make both of these events more personal. To me, the Qamishli uprising in 2004 was a classic example of the crystallisation of accumulated frustration and anger against the authority, which erupted spontaneously at an unexpected moment. It was in the same manner that the Syrian revolution kicked off in Daraa in March 2011. Both movements possessed all the essential elements that constitute popular uprisings of this kind, from the crystallisation of long-term social-political-economic suffering in a shocking incident, breaking through the barrier of fear, to a form of tribalism (ethnic, tribal, regional, etc.) that initially helps people stick together and move beyond the ‘national’ rhetoric imposed by the ruling regime as a deterrent or a bridle. However, the security apparatus and the army, along with a number of mercenaries from local Arab tribes, succeeded – unfortunately – in quickly extinguishing the Qamishli uprising by resorting to extreme and widespread violence, killing, detaining and terrorizing thousands of people. But the regime would not have been able to succeed in this were it not for the cowardice of the Syrian-Kurdish political parties, who did their best, with the collusion of the security apparatus, to calm people down; and were it not for the impotence of the ‘Arab’ Syrian opposition factions and their hesitation to support the movement as a legitimate Syrian popular political uprising. Indeed, many Syrian intellectuals and activists condemned the uprising at the time and levelled various accusations and negative epithets at it, such as ‘violence’, ‘treason’, ‘separatism’, ‘racism’ and so on. Ironically, some of these same activists and intellectuals are today blaming European and international leftists for their lack of support for the Syrian revolution under similar pretexts: ‘stability’, ‘resistance’, ‘anti-imperialism’, ‘the Islamist spectre’ (which is similar, to some extent, to the Kurdish bogeyman) and so on. Let us elaborate further on this point. How do you view the position of the Syrian opposition on the Kurdish issue? First allow me to emphasise that I don’t believe that there is one single Syrian opposition but many, just as there are many Kurdish issues that may vary depending on your moral and political position vis-a-vis these issues, from believing it’s merely about cultural and democratic rights to acknowledging or denying the right of Syrian-Kurds to self-determination. To me, and to many Syrian-Kurds, this position that I have just talked about (the position of many Syrian-Arab dissidents and intellectuals on the Qamishli uprising) summarises their historical complex towards the ‘Kurdish Issue’: on one hand, they insist that Kurdish political forces should work within a ‘unified’ national framework but, on the other, they don’t make any effort to re-constitute this framework so as to include and guarantee the national rights and demands of Kurds and other minorities in Syria. Of course I’m speaking here of tangible political and economic rights and demands, not symbolic, generic, rubber-like slogans. The least that can be said of this position is that it is double-standard and opportunistic. But the problem runs much deeper than that, in my opinion. It seems to me that the problem lies in the inability of these Arab-nationalists to imagine an inclusive national identity based on diversity that is neither reductionist nor assimilationist. Of course the Ba’th Party’s policy towards the Kurds (from oppression and discrimination, coupled with obfuscation and semi-complete ignorance about anything Kurdish, as well as the closure of all public spaces of debate and dialogue that could have countered this ignorance) played a big role in the deepening of this Arab-Kurdish rift. But we cannot blame the Ba’thists for everything. The position of many Arab-nationalists, who consider themselves ‘progressive’, on Kurdish issues in Syria is no less chauvinistic. We can add to these factors the insularity of the Kurdish nationalist movement in Syria, since 1950′s at least, and their inability to imagine forms of struggle other than one closed off on itself, so to speak. This phenomenon has complicated historical causes that can be observed in many national liberation movements across the world. 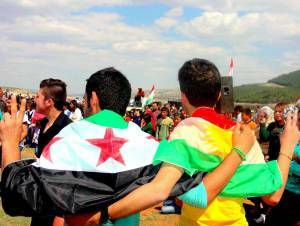 This chasm between the Syrian Kurdish and Arab oppositions began to subside to some extent after a number of Syrian-Kurdish political parties – particularly Yeketi and Azadi – opened up to some of the ‘Arab’ opposition factions and started to participate in their events and meetings, notably under the framework of the so-called Damascus Declaration. However, this was a partial and largely pragmatic opening, in my view, as evidenced later, after the revolution broke out, by the fundamental differences between the two sides within opposition groupings regarding the name of the Syrian Republic, for example, (whether or to include ‘Arab’ in the name), or how to define Kurdish rights… and many other disputes of this kind. A much more important process, in my opinion, in this regard was the outbreak of the revolution in 2011, in all that it meant for Syrians regarding a re-discovery of themselves and a discovery of the others who ostensibly shared this ‘homeland’ with them yet they did not know anything about them. The revolution meant the reconstruction of a Syrian national identity that is more colourful and diverse and less exclusionary. It was very significant, for example, that protesters in Kurdish and Arab areas raised slogans and banners and placards carrying messages of mutual support and solidarity. Like the slogans carried by protesters in Amuda and Qamishli and other Kurdish-majority towns in solidarity with Deraa, Homs, Aleppo and other places. Or the banners raised by protesters in Idlib, Aleppo, Homs and elsewhere expressing solidarity with Amuda and Qamishli and other predominantly Kurdish areas; banners and placards congratulating their Kurdish comrades during the latter’s national festive occasions, or consoling them during their ‘special’ tragedies (such as the assassination of Mesh’al Tammo). This phenomenon can be read from the perspective that I spoke about earlier (the building of a new national identity) and not merely as an expression of symbolic, mutual solidarity as a matter of reciprocation or sharing in the sense of victimhood. However, it seems this radical, creative process has not yet had an impact on the established Syrian opposition groups – both Kurdish and Arab – which remain captive to their outdated identities and rhetoric. How has the situation in Kurdish areas developed since the start of the revolution? How has the Assad regime dealt with the popular movement in these areas? What is the relationship between the various Kurdish groups and Syrian revolutionaries, the Free Syrian Army, the Islamist forces, etc.? Many accuse the Democratic Union Party (PYD), the Syrian wing of the Kurdish Workers’ Party (PKK), of collusion and co-operation with the regime. I don’t believe this narrative is very accurate. What happened, in my reading of events, was a pragmatic convergence of interests between the two sides in 2012. For the regime, the primary aim of this ‘understanding’ (i.e. the withdrawal of the regime apparatus from the predominantly Kurdish areas and handing their administration over mainly to the PYD) was the neutralisation of the Kurdish areas in the revolution, both militarily and politically (so as to not open up another major front in the north-eastern part of the country and to divide the opposition along ethnic and sectarian lines). The second aim was to use the PYD as a trump card against Turkey, the most significant supporter of the the Free Syrian Army at that time, in the hope of brokering a future deal with Turkey like the one in which the Syrian regime sold Abdullah Öcalan in 1999. And it appears the regime has failed in some of these aims and succeeded in others, for complicated and intertwined reasons that we cannot really go into here. From the PYD’s point of view, this was a golden opportunity to impose its authority and expand its sphere of influence in the Kurdish areas in Syria. This political pragmatism and thirst for power are two important factors in understanding the party’s dealings with the regime, the revolution, the FSA, and even the Kurds themselves. They also help explain many phenomena that seem to bewilder some commentators and analysts, such as the suppression by PYD forces of independent activists and those critical of the party’s policies, in much the same vein as the Baathist regime did. By way of example, one can cite in this regard the Amuda massacre in July 2013, in which the People’s Protection Units (YPG) opened fire on unarmed demonstrators, or the closure of the new independent radio station Arta in February 2014, under the pretext that it was not ‘licensed’. The PYD’s forces have also assaulted members of other Kurdish political parties and arrested some of them under a variety of excuses; they have been controlling food and financial resources in the Kurdish areas and distributing them in an unjust manner on the basis of partisan favouritism, and so on and so forth. Such practises remind people, rightly, of the oppressive practises of the Assad regime. After armed Islamist factions – the Islamic State of Iraq and Sham (ISIS) and Jabhat Al-Nusra in particular – started to attack Kurdish areas in mid-2013, igniting a war that continues unabated between them and the PYD forces, many Syrian-Kurds started to change their position towards the PYD and the YPG forces that it dominates. The Islamist factions are fighting this battle under an Islamist banner some times and under an Arabist banner at others. But the real engine behind them is the Turkish government, the arch-enemy of the Kurds, in addition to the strategic position of these regions on the Turkish and Iraqi borders, as well as their richness in oil. The combination of these factors has pushed many Kurdish-Syrians to accepting the PYD’s authority out of self-defence or out of fear that the radical Islamists might win and subsequently impose their rule and their values that are alien to the local population, like what happened in al-Raqqa. In addition to all this, Syrian-Kurds on the whole are less religious and less religiously extreme than a lot of other Syrian social groups. Despite everything else, the PYD continues to talk about secularism, democracy, women’s rights, etc. Even those most critical of the party started to see it as the “lesser of two evils”. I know many Kurdish activists in Qamishli, Amuda and other areas who, before these developments, used to organise demonstrations and write against the PYD, but have now suddenly started volunteering in the ranks of the YPG, which is largely controlled by the PYD, to fight against the Islamists for the reasons previously mentioned. This change in the attitude of many Syrian-Kurds towards the PYD was bolstered by the double-standard position of the Syrian opposition, particularly the National Coalition and the Islamist factions, towards the ISIS, even after the FSA declared a war against it. While many opposition pages and websites overflow with critiques of ISIS and lampooning their practises, when it came to the fighting between the ISIS and the PYD forces and their allies in the Kurdish areas, the ISIS suddenly transformed into “the Free Syrian Army” and the entire talk became about a conflict between “the opposition forces” and “the separatist Kurds”. I personally do not believe that such mistakes are always intentional. They are, for the most part, the result of the Kurdish bogeyman and the inability to imagine a non-exclusionary national identity. I have already touched upon both points. It is my belief that, if the performance and rhetoric of the Syrian opposition factions does not improve as far as Kurdish issues are concerned – radically and meaningfully, and not in terms of dubious pragmatism – it will only lead to the strengthening of the PYD in Kurdish areas, both at the expense of other Kurdish popular revolutionary forces and at the expense of any hope in one Syrian homeland for all. What do you think of the Kurdistan Workers’ Party (PKK) in general? And what do you make of the self-governance/autonomy experiment in Syrian Kurdistan? As I have already said, the practises of the party, both past and present, recall the practises of the Assad regime and others oppressive, totalitarian regimes like it. And it is a resemblance that has objective reasons. The PKK is a nationalist party that is highly ideological and based on a strict military regime and blind loyalty, as well as the apotheosis of the leader and the notion of one party that leads society and the state. In this sense, the PKK is not very different to many Arab leftist parties that have been riddled with these Stalinist-Leninist plagues. As for the experience of self-governance, we first have to distinguish between the aspirations and rights of a group in seeking independence and autonomy and between a specific model that claims to embody these aspirations and rights in practice. So if we are talking about the right of Syrian-Kurds to autonomy and self-determination – provided that this is what they desire – then, of course, I support this right, as should anyone who claims to be a leftist or progressive. Anyone who says otherwise is either a hypocrite or a fascist. I am personally against nation-states and states in general. However, if a group of people, or a majority of them, aspire or seek some aim – regardless of whether or not I agree with it – or if a nation-state was the only possible framework that can currently achieve greater freedom and justice for them, then of course I support these aspirations and endeavours. But if we are talking about the PYD’s current project in the Syrian-Kurdish regions, then the matter becomes more complicated. On one hand, it seems that the experience has begun to achieve commendable gains, such as secular management of the state apparatus, ensuring greater rights for women and the participation of minorities in administration, a greater participation and more agency for the local population in the management of their affairs, especially with the absence of a strong, established state. And we should remember here that the PYD is leaning against a rich experience of self-governance that their comrades in Turkish Kurdistan have been living through. On the other hand, however, the experiment may well end with the strengthening of the PYD’s dominance and the increase of oppression in the name of protecting these gains, along with their gradual squandering in return for narrow political interests. This is a real and possible danger. I imagine that, if I were living in one of the three Kurdish cantons that are currently under the rule of the self-governance administration, I would have participated in the experiment in one form or another, but I would have tried as much as possible to work with other activists and actors in order to save it from the dangers that I’ve just mentioned. Do you think it is possible to build a Third Force, that is democratic and progressive and guarantees the fulfillment of the original goals of the revolution, and that is independent from the regime and the backward Islamist forces? I don’t really like the label “Third Force”, which is being used to describe Syrian-Kurdish forces or the PYD to distinguish them from both the regime and the ‘Arab’ or ‘Islamist’ opposition. Because the label assumes, or imposes, the homogeneity of Kurdish forces and the unity of their aspirations, just as it assumes the homogeneity of the opposition factions. In any case, I believe that what has been happening in the Kurdish regions – despite all my reservations and criticisms of the PYD – is a step forward if we are to compare it to the other alternatives that could have dominated the region (the regime or the radical Islamists). But I do not think that the PYD and the PKK are the right political carriers that are capable of achieving true freedom, democracy and social justice, which are being sought by many in Syria. I do not doubt for a moment that the PYD – if things carried on like this – will re-produce an oppressive, totalitarian regime, just as what the Ba’th party or the two ruling parties in Iraqi Kurdistan did – bearing in mind the differences in their experiences, of course. The same applies to many of the other Syrian opposition factions, from the radical Islamist forces to the nationalist leftist parties that lean towards fascism. The hope is that the revolutionary movement will continue and give birth to different forms of organisation and self-organisation, and to new structures that are more consistent with the original values and goals of the revolution. But as long as blind violence continues (mainly from the regime and its supporters), and as long as leftists continue to focus their energies on civil society activities and leave the arena of political and armed struggle to others, the chances of fulfilling these hopes become weaker and weaker. Of course, it is not easy, after all that has been happened, to go back to the days of the absence of democracy and freedoms, at least in the short term. But the achievement of true social justice is a whole other matter. Posted on April 7, 2014, in Middle East and tagged Kurds, Syria, syrian revolution. Bookmark the permalink. 3 Comments.